Do We Have to Join Facebook to Prove We Are Not Psychopaths? The Daily Mail article headline made me do an incredulous double-take: ”Is Not Joining Facebook a Sign You’re a Psychopath? Some Employers and Psychologists Say Staying Away from Social Media is ‘Suspicious’”. Well, there’s already enough vigilance, if not outright paranoia, these days to not require compounding it with a “See Nothing, Say Something” policy like the one implied by that headline. the probability that a job applicant (or someone, anyone over the required age of 13) is a “psychopath”, if (s)he does not have a Facebook page? the probability that a job applicant (or someone, anyone over 13) does not have a Facebook page, if (s)he is a “psychopath”? These two concepts and calculations are not the same. Which one of these is the Daily Mail article about? Or is it supposed to be about both? Theoretically, the second probability could be extremely high—if most psychopaths shun social media interaction and manipulation, yet the first probability extremely low, especially if there are very few “psychopaths” in the population. the probability that someone is a psychopath, if (s)he has a Facebook page? 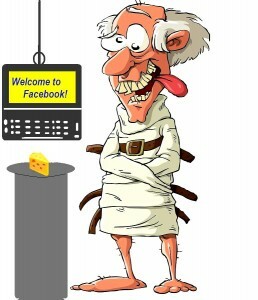 the probability that someone does not have a Facebook page, if (s)he is not a psychopath? the probability that someone has a Facebook page, if (s)he is a psychopath? the probability that someone has a Facebook page, if (s)he is not a psychopath? the probability that someone is not a psychopath, if (s)he has a Facebook page? the probability that someone is not a psychopath, if (s)he does not have a Facebook page? the probability that someone is a not a psychopath and (not) on Facebook. If the Daily Mail article is to be taken seriously, each one of these probabilities would have to be calculated and compared to determine whether indeed psychopathology and Facebook (non-)use correlate to a statistically significant degree, in comparison to each of the other probabilities listed here. (For the mathematically inclined, a Bayesian analysis, which will not be undertaken here, is a good start). In any case, the vague claim made in the Daily Mail article is weakened not only by its failure to consider these other probabilities, but also by the lack of any indication of what counts as being a “psychopath”—a term that is not used as a clinical category in the American Psychiatric Association‘s DSM-IV (Diagnostic and Statistical Manual of Mental Disorders). Apart from the really big and important differences and relationships among these questions, and, for the moment, setting aside the mathematical calculations and inferences required to answer them, selectively asking only or either of the first two injects a second kind of inference, in the form of a dark insinuation, into the conversation: the suggestion that psychopaths are more likely to not use Facebook and that those who don’t use Facebook are more likely to be psychopaths. The question asked in the Daily Mail headline insinuates that somehow passing up the chance to be on Facebook (or not being on it for any reason whatsoever, including inability) constitutes evidence of psychopathology, just as the question, “Can you prove that you haven’t been beating your wife?” (a less question-begging variant of “Have you stopped beating your wife?”) does. That is to say, merely asking the question constitutes an insinuated accusation. The Daily Mail question does not deserve to be taken seriously. However, what does deserve to be taken very, very seriously is the scary fact that anyone has, in the absence of some strong statistical evidence, even broached that question or, worse, has suggested answering it affirmatively. That’s scary, because underlying, if not motivating such questions may be a spooky attack on “freedom of non-expression”—itself the flip-side of the ongoing onslaught on privacy (since insisting we all be on Facebook is indeed tantamount to demanding we relinquish a lot of our privacy to Facebook, to data miners, advertisers, surveillance agencies and to countless Facebook subscribers). To be fair to the Daily Mail, its article merely picked up where a Forbes article left off. That recent Forbes piece, “Beware, Tech Abandoners. People Without Facebook Accounts Are ‘Suspicious’’, segued to psychopathology from the possibility that a guy a girl is dating may be “hiding” something or otherwise be suspicious for not declaring and acknowledging their relationship on Facebook. Although that Forbes article does display some common sense in mentioning those who are too busy, private or otherwise uninterested in having their own Facebook page to bother creating one, the headline is, as always, what will linger in the imagination and concerns of employers and doubting sweethearts alike. So why would or should any of us be under any kind of pressure to express ourselves through Facebook, or risk falling under employer or general suspicion—of not only lacking “friends”, of “hiding” something, but also of being a “psychopath” if we are Facebook resisters or otherwise “AWOL” (“Absent Without Leave”) from Facebook? Underlying that pressure is some seriously flawed (non-)thinking. The suggestion that absence from Facebook is pathological utterly disregards one of our fundamental freedoms: the right to remain silent. First-amendment rights cover “freedom of expression”, including “freedom of non-expression”. Specifically, constitutional protection from criminal “self-incrimination” partially covers “freedom of non-expression”. Miranda rights—the right to remain silent when under arrest—is another example, ironic in the fact that it reverses the “exercise of the right to silence—suspicion” inference into “suspicion—exercise of the right to silence”, i.e., when one is accused, suspicion triggers the exercise of the right, not the reverse, unfortunately, a broad right the Daily Mail article’s reporting ignores. Too many people confuse “not average” with clinically “abnormal”, i.e., they confuse “abnormal” in the statistical sense of being a statistical exception, an “outlier”, with clinical and unhealthy abnormality. An IQ of 180 is “abnormal” statistically, but not in the clinical psychopathological sense. Likewise, critical thinking is apparently also far rarer and non-normal, without presumably being therefore pathological. In its most primitive and average manifestations, this confusion amounts to nothing more than fear of anything or anyone that is different. Another reason why such nonsense can float at all is that it seems all too easy to confuse facts that are consistent with psychopathology with facts that confirm it. Being left-handed, over or under six-feet tall, having a fondness for French fries and countless other things are consistent with being a psychopath, in the sense of coexisting with that condition, without confirming that diagnosis in the slightest. The Forbes and Daily Mail articles mention the (convicted) mass murderer Anders Breivik and (accused) “Joker” James Holmes as individuals who never “had much of a social media presence” (however, still some). But, suppose neither of them wore pajamas to bed nor ever watched “American Idol”. Is this evidence of pathology or of anything at all, even though (not)wearing pajamas is merely consistent with “psychopathology” (while allowing that obsessing over “American Idol” may raise some doubts)? For the allegation that being absent from Facebook is any kind of special evidence of “psychopathology” or of being a “psychopath”, we must consider and determine to what degree Facebook is used and favored by psychopathic predators. These will include molesters, stalkers, pimps, bullies, scam artists, serial killers, terrorists and otherwise incorrigibly evil, crazy, mean or otherwise “suspicious” and “dangerous” individuals or groups. It was heartbreaking to read the recently reported tragedy of a 15-year-old Canadian high school girl humiliated and bullied online (and offline) to the point of ending her own life. If anything deserves to be called pathological, it is mercilessly and brutally using Facebook to hound and torment an innocent that way. That said, are such stories evidence that being on Facebook justifies suspicions of being a psychopath? The point is that, in the absence of a detailed statistical analysis, there is as much or as little warrant for being suspicious of those who are on Facebook as of those who aren’t. The accusation is stupendously ethnocentric, class-based and otherwise narrow in overlooking the obvious fact that there are billions of adults around the world who are not on Facebook for reasons completely unrelated to anything remotely resembling “psychopathology”. those who, indeed being “suspicious” are such in only the second sense—suspicious of Facebook’s and its associates’ and users’ intrusions into and surveillance of our contact lists and other personal information. Ironically,the creation of a surveillance society in some parts of the world is served by allowing Facebook there, yet equally evident in regions that block and prohibit it. What’s a “Psychopath”? What Are the Odds of Encountering One? Ignoring the differences among the probabilities listed above compounds the vagueness of the suspicions, inasmuch as “suspicious” and “psychopath” are neither synonymous nor precisely (or accurately) used in these articles. So who are psychopaths? “Broadly speaking, they are people who use manipulation, violence and intimidation to control others and satisfy selfish needs. They can be intelligent and highly charismatic, but display a chronic inability to feel guilt, remorse or anxiety about any of their actions. Scientists estimate that 15-25 percent of men and 7-15 percent of women in U.S. prisons display psychopathic behaviors. Pen Pals, Villagers and Infants–How Many Psychopaths? So if you’ve got a “pen(itentiary) pal” serving time in prison, there’s as much as a 25% chance you’ve got a psychopath friend, presumably higher if (s)he’s not on Facebook and the Daily Mail’s insinuation is correct. Otherwise it’s a 1-in-100 chance. Now, if there are 800 million Facebook subscribers, there are about 7 billion non-subscribers, including infants, preteens and villagers without electricity. Now, suppose that EVERY ONE of the psychopaths in the world avoids Facebook and has blended into those 7 billion non-subscribers. What are the risks then? To keep things close to home and to give the villagers and infants a break, focus on the U.S. and its Facebook population. It has been estimated that in 2010 approximately 41.6% of the U.S. population had a Facebook account (presumably including the estimated 7.5 million under-13s with in-violation accounts). This means 59.4% of the U.S. population did not have a Facebook account at that time. Call that 60%. If that number of non-subscribers ever drops to 50%, the likelihood that a randomly chosen individual in that group is a psychopath will become double the likelihood in the general population, and increase to 2 in 100. That’s on the assumption that all the psychopaths are in that Facebook non-subscriber group and that group decreases to half the total population. So, there will then be twice as many psychopaths in the non-Facebook population than in the general population, the latter currently being 1 in 100. OK. So is a 2-in-100 risk that much stronger a reason to be suspicious of anyone than a 1-in-100 risk is? Suppose you buy a lottery ticket with a 2-in-100 chance of winning instead of 1-in-100—are you suddenly going to start drooling? Hardly. Ditto for a 1% increase in the chance of encountering a psychopath. So, even if every single one of the U.S. psychopaths were among the U.S. non-subscribers, and the U.S. non-subscriber population shrinks to 50%, the chance that a Facebook non-subscriber is a psychopath would still be no more than 2% (currently being even less than that). This is the “probability that a randomly-chosen individual is a psychopath, given (s)he is not on Facebook”. It is imperative to note that, on my hypothetical assumption that not even one psychopath is on Facebook, which I made for the sake of argument and illustration, the probability that a randomly-chosen individual is a psychopath, given that (s)he is not on Facebook, is no more than 0.02, i.e., a 2% risk—actually less than that, since 60%, rather than 50% of Americans, are currently not on Facebook,. Having thought about this long and hard—with all the time freed up by not being on Facebook, my best guess is that there indeed is a psychopathology associated with not being on Facebook. The paranoia among some of those who are.